Defence for Children International Ghana is officially registered and active in Ghana since 1996.It became a DCI section in 1997 during the International General Assembly of DCI held in Dakar. 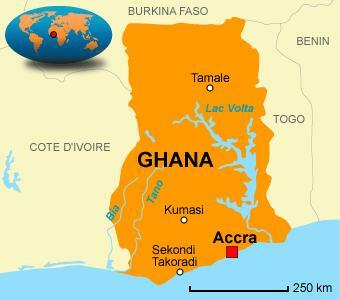 DCI-Ghana is based in Kumasi. It can counts on a team of 4 people working on a full-time basis, 5 on a part-time basis and a team of 4 volunteers. Its General Assembly is composed of 34 people with different expertise in the field of human rights, international cooperation, social activism and militancy. To respect, promote and protect children’s rights as enshrined in the UN Convention on the Rights of the Child. To create awareness and foster cooperation on the promotion and protection of children’s rights in Ghana. To seek, support and implement the most effective means of protecting children’s rights in identified situations. The Girl Power Programme is a regional programme, supported and funded by the Dutch Government, to promote the rights of the girls child and create opportunities for their protection, to have quality education and access to vocational and technical training, socio-economic and political empowerment. It is implemented in 10 countries: Bangladesh, Bolivia, Ethiopia (FSCE),·Liberia, Nepal, Nicaragua, Pakistan, Sierra Leone, Zambia (Children in Need Network) and Ghana. DCI-Ghana participated in the development of Ghana country proposal on the Girl Power Project coordinated by Plan Ghana from 2009 - 2010. This resulted in the inclusion of DCI-Ghana in the project implementation come 2011 – 2015. Participation of DCI-Ghana also raised the spirit of the organisation in fund raising and project development. DCI-GH is working on the protection component of the project by using its experience in socio-legal services to prevent violence against young women. The project sought to deal directly with 1, 000 and indirectly with 3, 000 girls and young women aged one to 24 years.DCI-GH is targeting 20 communities, five governmental organisations, 10 civil society organisations and 20 community-based organisations in the Kumasi Metropolitan Assembly (KMA) and the Obuasi Municipal Assembly of the Ashanti Region. - Distributed 400 copies of fact-sheets to promote the awareness-raising on the General Comment No. 10 Children's Rights in Juvenile Justice during press conference, meeting with children and training seminar with government officials and professionals working on juvenile justice in Kumasi. The Fact sheets facilitated the participant’s understanding of the GC10 as well as the education of the general public. For more information about the General comment no. 10 project. - Distributed about 2000 reproduced flyers and posters on child rights produced by DCI-Ghana during the implementation of Socio-Legal Defence Centre project from 2003 – 2004. - Sensitised 16 media personnel and other civil society personnel on the GC10 through press conference who in turn sensitised the public by press news and commentaries. - Created networking among 17 partners of civil society organisations, governmental and non-governmental agencies and coalition through round table discussions on the GC10. This led to a Memorandum of understanding between DCI-Ghana and Centre for Human Rights and Advanced Legal Research (CHRALER) to protect the rights of juveniles in conflict with the law and other abused children. - Views from 42 school children on the GC10 collected in a meeting and fed into discussion at workshop for government officials and professionals. - General Comment explained to 19 governmental officials and discussed the need for follow-up action in a training seminar. DCI-Ghana continued to visit the Juvenile Remand Home in Kumasi to monitor the situation of detained juveniles in the home. During the visits, DCI-Ghana interacted with the personnel of the home to learn about the situations and conditions of the juvenile in-mates. Counselling was provided to both the personnel and the juvenile detainees on how to improve the conditions at the home and appropriate assistance for the in-mates.Due to limited resources, tracing of families of the in-mates were very limited in these years. DCI-Ghana however provided counselling and education to families who came round to visit their delinquent children in the remand home. In all about 12 juveniles benefited from this service. - DCI-Ghana sensitised and trained 23 professionals working on Juvenile Justice in the Kumasi Metropolis in Ashanti Region of Ghana based on their needs assessment conducted in March – May 2008. - DCI-Ghana participated in the African Regional Seminar on Addressing the Economic, Social and Cultural root causes of torture and other forms of violence organised by the OMCT in Maputo, Mozambique from 7 – 11 May 2008. - DCI-Ghana participated in the African Regional workshop on Juvenile Justice in Freetown, Sierra Leone in October 2009. The workshop resulted in the collective commitment of the African sections of DCI towards Juvenile Justice and Childs promotion in the continent. The workshop also discussed a strategic plan for DCI Africa on Juvenile Justice, a framework out of which the African sections including DCI-Ghana could tailor its plans in the local context.